Merry Christmas to all Star Trek fans, so say Viacom. I will continue to have scheduling information, but no images, audio or video files will be available from here, until further notice. My site has been around for a few years now. I believe there may be legal precident in their taking so long. Unfortunately I am not a lawyer and do not know what kind of time limits there are. Paramount certainly cannot claim they haven't known about my site, that would be a plain lie. I for one cannot see how any fan run site that does not use these images, etc. are harming Paramount properties. As far as I know, no one is using their properties for profit. On the contrary, many of the sites, mine especially, are there to solely promote Star Trek. I provide a service that Paramount does not; scheduling information. If anything, what I, and many others, do is promote interest in the programs, which ultimately means money in the pockets of Paramount. It also means more viewers for the TV programs, which ultimately mean more advertising dollars. What is interesting is that Paramount has a movie currently playing in the theaters... yep... Star Trek: First Contact. As you well know, it is about the Borg trying to assimilate the human race on Earth. That is exactly like Viacom (the Borg) trying the assimulate all of the fan run Star Trek sites (the human race). Guess what, the Borg lost!!! Chairman & CEO, Viacom, Inc.
Keep an eye on this page for more information, as it becomes available. At the first official con over in Auckland, New Zealand, held at Photon Productions' "Holodiction '98", Guy Vardaman, the producer of the Continuum, said that Viacom only sent out the letters to people making money off advertising, etc and all the other Trek sites are safe as long as they acknowledge trademarks on image, video and audio files. He also stated unofficially that the Continuum will be fully functional for every one very soon. It was mentioned that not all of those getting one of the ten letters were doing anything to earn money from the site (advertising banners, good for sales, etc.). He said that the legal people went after the largest and most well known sites, because when they joined with MicroSh!t [my description] to help create and prove the site, they were told by MicroSh!t that they needed to protect their trademarks more on the net or they would be taken away from them. He was saying that he worked in the licensing department before he got asked to head up the the content side of the new Digital Entertainment Department, which was when Paramount decided to expand their ST presence on the web. It was MicroSh!t that approached them with a 2 year MSN contract saying they could make the site the way Paramount wanted it to look! So, it appears that Viacom is now taking the same stance as Warner Bros. Clearly mark that the information belongs to Paramount and don't attempt to earn any money. I gather that includes the advertising banners, as Guy mentioned. As a side note, do not list your Star Trek web site in the Continuum's newsgroup pages. Paramount is very unhappy with those who do that. My guess is that they think that someone will assume that Paramount is endorsing the sites that are listed there. Paramount endorses no web sites, other than their own. Now magazine's article about the Viacom War is now available for your reading pleasure. Did an interview with Colman Jones, of Canada's Now magazine (based in Toronto). He is doing an article on the state of Viacom's war on the web sites. He is also trying to interview Viacom and he currently is getting passed around. Hopefully he will get connected with someone who can supply info on what Viacom is up to. Total TV has posted an article about website crackdowns. Paramount Digital's president has posted an open letter to Star Trek fans. Here is my e-mail response to his open letter. I just found out that LEGO has page about how they want their trademarks used in web pages. Well worth the read. Here is an article from the Sci-Fi Channel's News of the Week. Here is an editorial from the editor of Mission Profile. I received my copy of Entertainment Weekly today. There is an article about this situation in there. Here are more comments from JMS that he recently posted. 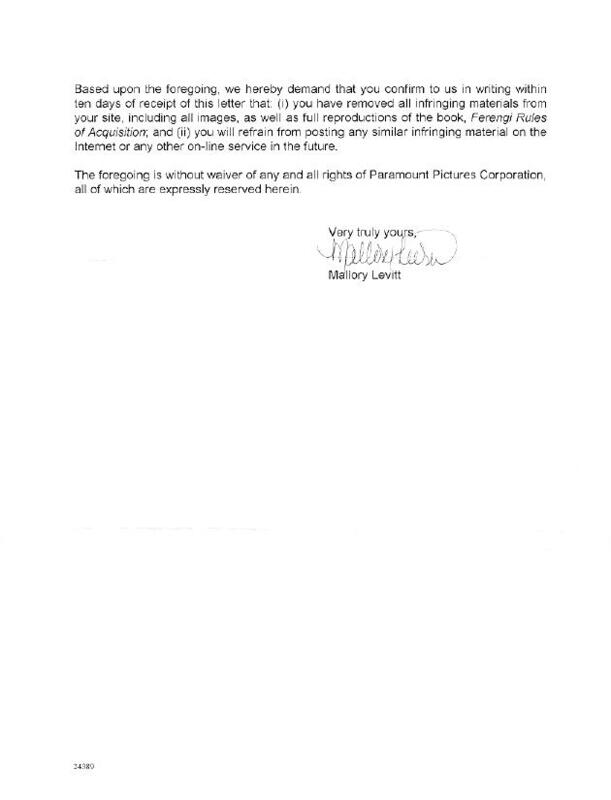 Q: A Trek fan reproduced a copy of the letter that Viacom has sent out to webmasters who feature Star Trek resources on their sites. Can you give us a comment? A: This is a most unfortunate development. But there are some ways you can try to deal with this constructively. Last year, WB became aware of the existence of many BABYLON 5 sites, and the Legal Affairs Department was of a mind to take similar action (as has been taken by other shows, including the Simpsons). The reason for their desire is simple. It's not that the sites present a *threat* per se, but there is the issue of copyright protection at stake. To explain...and this may help you to at least understand Paramount's position, even if you don't agree with it...if copyrighted material begins to be passed around freely, and copied, and redistributed, and published, without the proper protections, eventually the material will become *public domain*. The studio no longer owns it. In order to demonstrate that you own the material, you must make consistent, and conscientious efforts to protect your claim to that name and/or that property. Many companies and individuals have actually *lost* the right to the copyright of material they own or created because they did not take steps to actively protect it. Which is why you often see advertisements from companies like Xerox reminding people that it's a *company name*, and not a generic term for photocopying. Otherwise they risk letting that name become a word, part of the vernacular, and as indefensible as saying "tissue paper" is a copyrightable term. When material from a show is posted without the proper copyright protection, every time you allow this to happen it moves that material further and further into public domain. Once it *becomes* public domain, the studio will not be able to profit from it, ownership questions come up, and outside agencies can produce anything they want, slap that name on it, and sell it. It's a cumulative effect, over time. And it *is* a real problem; don't delude yourself by saying so because you *want* it not to be so. The law is the law is the law. When this came to our attention, we (acting sort of as fan advocates) sat down with WB legal and discussed ways of doing it short of sending out these exact sort of letters to BABYLON 5 sites. What we came to was the following understanding: that WB would not actively go after sites which used B5 photos and other material PROVIDED THAT the proper copyright information was appended to the material utilized. They are currently in the process of verifying and evaluating sites before sending letters telling them to append this information. This seems to me a fair and reasonable response to what is, in truth, a genuine concern. What may help here is for system operators of web sites to append the copyright information, and notify Paramount that they are in full and complete compliance with copyright, and acknowledge formally that Paramount is the owner of all copyrighted material posted on that site. They may, or may not, accept that, but it gives you a place to start. Obviously, magazines use copyrighted images all the time, and Paramount makes no effort to stop that...but if you look in the edges along photos and the like in these magazines, you will see the words "photo copyright (c) 1997 Paramount Television." That is the difference that allows them to use this material. There is no immediate reason why sites should be viewed in any way differently than a magazine, IF the laws are followed. So point is...the concern expressed by Paramount is legitimate, and you should abide by it, OR see if you can find some compromise position by adhering strictly to the copyright laws in how material is displayed, and what material is selected, as we have done with the B5 sites. You may also want to write to those currently running the ST franchise to see if the producers of the show can intercede on the behalf of ST fans as we did for B5 fans. Lawyers have little or no vested interest in the fan/show relationship; those involved directly in these shows, do have a vested interest. Usual disclaimer: I am not an attorney, and can only speak from anecdotal information, and have no specific information about Paramount, and am in no way suggesting any difference of opinion with their actions. I'm only trying to help you understand the issues involved. Here is an article from the New York Times. Here is an article from the Beacon Journal Extra. I was interviewed by Amanda Lang of the Financial Post yesterday. Photo: CYBERWAR: Crackdown on `unofficial' Star Trek sites has angered fans. In Star Trek-fan parlance, the situation is simple: The Borg has started to assimilate the Internet. In English, that means that Viacom Inc., the media giant that holds rights to all Star Trek material through its subsidiary Paramount Pictures Corp., recently began cracking down on the myriad of "unofficial" Trek sites that crowd the Internet. And the fans aren't pleased. By one count there are more than 100,000 such Web sites, but Viacom targeted only a select few of them, in a pre-Christmas greeting letter from its corporate lawyer. Viacom spokesman Carl Folta said it has never been the company's intention to shut down every Trek page, only those that violated the copyright in some gross fashion, or crossed the line from fan page to commercial site. "I don't think the fans would argue that a site that sells Star Trek material is not a fan site," said Folta. Viacom is concerned with protecting its trademark. Current U.S. trademark law requires the holder to make every effort to protect a mark or risk losing some claim to it. What Viacom may not have counted on was the ferocity and organization of the response. Browse through the host of Trek pages on the Web and it's hard not to find a reference to the fight, while so-called "resistance" pages have proliferated. 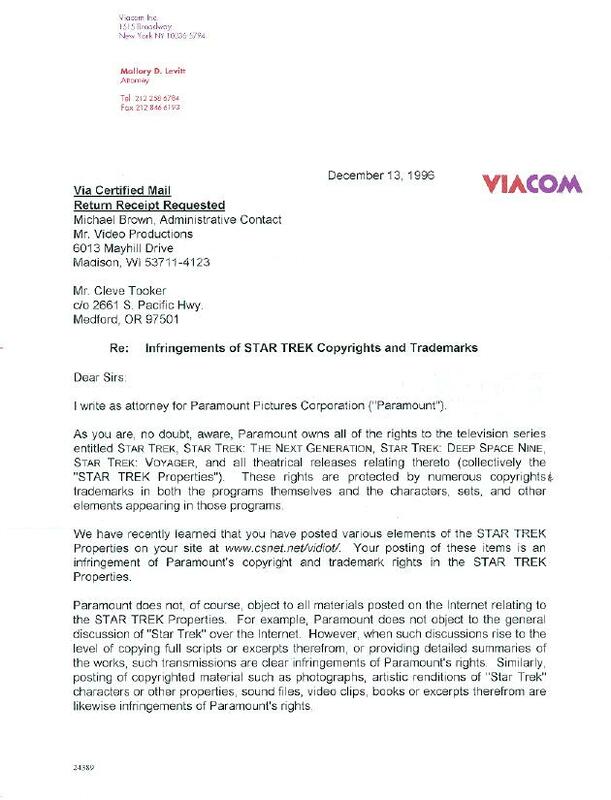 Still, for the most part, Viacom achieved its aim -- many Trek pages have removed copyright images, sound bites and script excerpts. But was it worth it? No, said Misha Glouberman, a Toronto-based Web publisher who runs a page devoted to trademark wars on the Internet. "What you have here is a group of very vocal, very active fans, who are now very upset with Viacom," said Glouberman. The trouble, however, is not as much with Viacom as with the laws themselves. "The laws make bullies out of companies," he said, "and those laws don't work in an electronic publishing world." The difference has less to do with Web culture -- noted for its laid-back mentality and information-sharing ethos -- than with the fact that the Internet has created a growing pool of self-publishers, said Glouberman. And unlike newspaper or magazine publishers, they don't have access to legal counsel that can guide them on their rights. "The vast majority of the [trademark] letters that get sent out are just nonsense," said Glouberman, "and any lawyer on a small newspaper could tell you that -- but when an individual gets one of these letters, it's a different story." The result is that in some instances, such as when Internet sites are operated through a service provider with some measure of control, such as a university, the Web page author has very little choice about how to respond to trademark complaints. Many such Trek pages have simply been shut down. Jonathan Agmon, a lawyer pursuing his masters degree in intellectual property law at George Washington University, is less indulgent of the individuals behind the Web pages. "Internet users should not be surprised that the laws outside the Internet are the same when we apply them to the Internet," he said. Other online trademark disputes border on the comical, such as a man named Newton who made the mistake of legally registering a bulletin board in his own name. Apple Computer Inc. sent him a cease-and-desist letter, saying the bulletin board infringed on its Newton trademark. When he ignored that, Apple arranged to have verification of his domain name put on hold. But odd-sounding or not, trademark disputes are no laughing matter for companies trying to guard theirs. Glouberman suggested that part of the impetus behind Viacom's letter was simply that it was posting its own official Star Trek site, Continuum, as part of Microsoft's network. Viacom executives deny this. But Mike Brown, who runs an official Star Trek homepage (www.cdsnet.net/vidiot) and has communicated with other Trek fans, site-operators and Viacom executives, said "the timing is a little coincidental." And although it is too soon to measure how die-hard Trek fans will react over the long term, Brown said there is already some fallout in the form of unofficial boycotts. "It would have been easy for Viacom to work with the fans," said Brown, a sentiment Glouberman echoed. "A lot of publishers and broadcasters tend to think of the world in which they operate as a one-way medium," said Glouberman, "but that's never been the case for shows like Star Trek, with a strong cult following." Copyright 1997, The Financial Post. Reprinted by permission. Well, I've finally finished my letter to Viacom. It goes out today. I'm finishing up my letter and will have it posted here shortly. The article at News.com is now available. There is a minor mistake in the article though. I told her that I have been posting information about Star Trek since December of '87, but it was about ST:TNG and it was to the newsgroups. Obviously the web wasn't around in 1987. I guess she missed that point. I also tried to point out that Paramount has know about me for a couple of years, as far as the web site is concerned. At 2:30pm (CT) I will be doing an interview with Bob Collins, News Editor MN Public Radio. It will appear on Thursday's Future Tense show and on the web site. If you get MN Public Radio, listen for it, otherwise, watch for it on the web page. I'll have a link here when it is up. Well, it is 2:46pm (CT) and I've just completed the interview. Watch for the link to the interview. The following article was posted to the Houston Chronicle Interactive site. If you are not already registered with the site, you will have to do so before reading the short article. On November 28, 1996, the Washington Post did an article about Viacom and Star Trek: First Contact. There is also an expanded web version. It is now 6:10pm CT and I just got off the phone with Janet Kornblum, Senior Writer | CNET | www.news.com. We talked for about 15 minutes. Looks like an article will be coming out soon. Watch for it. Today I received some e-mail from Willard Uncapher, an instructor at the University of Texas at Austin. The is a copy of the e-mail that he sent to Jeff at the Tholian Web. It also contains a well thought out letter from Willard to Viacom regarding this whole situation. You may or may not be aware that Viacom is trying to shutdown any Web site that does more than provide discussion of Star Trek. Seems to me that they are going to shoot themselves in the foot. The fans are what has given Star Trek life over these many years. Would you or WB consider taking such action against Fan maintained B5 sites? I maintain a page for Houston B5 viewers and this would most definitely affect the layout of my page. It's a sane and sensible policy, and thus far it seems to be working. Today I went to the Post Office during luch to get the letter, but they couldn't find it. After lunch I saw the mail carrier to find out if he had it with him, he didn't. When I got back to work, I got a message that the found it; misfiled. Needless to say, I picked it up after work, and here it is, both page one and page two. I was interviewed by Steve Silberman of WIRED News. He has posted an article about the Viacom warpath. 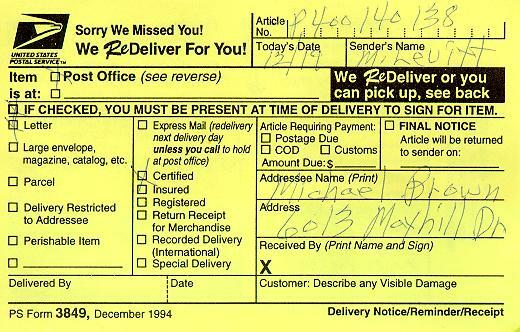 Today I received a Post Office Delivery Notice in my mailbox. I tried to pick it up tonight, before the Post Office closed, but they couldn't find it. I'll pick it up tomorrow. The following article was posted to the Wired News site. Last modified on Sunday, 12-Sep-2010 23:22:55 CDT.